Transport for London’s (TfL), ‘Art on the Underground’ project showcases visual arts across the network. 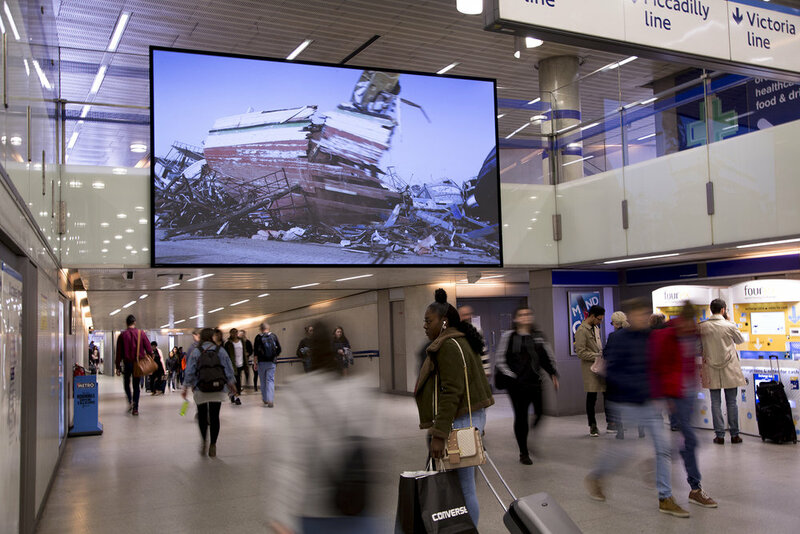 A few months ago, having commissioned a film from Broomberg & Chanarin, TfL was looking for the right kind of display to show the film in King’s Cross Tube station. Having been aware of dnp Supernova’s advanced contrast-enhancing technology for some time, TfL’s long-term specialist advisers, ADi Audiovisual approached VDL to supply and install a 5m wide dnp Supernova Infinity Screen as the central media display, which is paired with a Panasonic 10,000-lumen laser projector. But there were other criteria that also needed to be met. Understandably, TfL has the strictest of fire and safety regulations, and therefore an intensive review was first undertaken to ensure Supernova met these stringent requirements. Weight was a further factor as the screen had to be installed on an existing glass balustrade. The screen itself is situated in the main ticket hall at Kings Cross tube station which has one of the largest footfalls across the tube network and will be viewed by passengers on both the lower and upper levels of the station. The 12-minute film made by Broomberg & Chanarin is called The Bureaucracy of Angels. It will run until 28-November at King’s Cross St. Pancras Station, close to the exit to Eurostar.